Madeline Finney: I thought you'd be out healing lepers or feeding the hungry or something, but not this. What happened to you? Father Daniel Clemens: I grew up. Just like everybody else. To me, there's something absolutely majestic about the priesthood. The idea of men turning away from their own ambitions and seeking a higher power is inspiring and a perfect subject for the silver screen. Of course, in today's world we sadly see the shortcomings of priests and realize that they are, after all, quite human. Such is the way of Father Daniel Clemens (Christian Slater) in the unbalanced mystery, The Confessor. Far from an angelic role model, Father Clemens is a man of the cloth who is very much interested in material goods; he drives a luxury car, wears a gold watch, and drinks expensive champagne. Daniel is working to secure a new children's hospital, and his work rarely allows for him to tend to a parish, for he's too busy rubbing elbows with the Cardinal (Gordon Pinsent) and the Church's lawyer, Henry McCaron (Stephen Rea). The good times come to an abrupt end, however, when a fellow priest is charged with murdering a young boy. The accused Father Thomas Andrews (Daniel Kash) maintains his innocence, but cannot divulge any information about the crime due to the seal of confession. The plot doesn't delve into the Church's politics too deeply, brushing off the concerns of the hierarchy quite quickly and opting to focus on Father Clemens' own struggle to save himself by unlocking the murder's mysteries. Enlisting the help of his former fiancée, the reporter Madeline Finney (Molly Parker), Daniel leaves no stone unturned and turns up plenty of trouble along the way. I wish I could say the true killer's identity is a surprise, but Brad Mirman's screenplay is far from original and most of its plot twists can be seen coming a mile off. Truthfully, the whole mystery angle of the film feels somewhat forced, with Clemens and Madeline acting out the part of a Father Dowling Mysteries plot with about the same amount of credibility. The more compelling aspects of the movie focus in on Clemens' struggle to regain his faith in the priesthood. When Clemens takes over Andrews' responsibilities at St. Dominic's parish alongside the severe Mrs. Gallagher (Nancy Beatty), there's a tremendous opportunity for the movie to explore the life and struggles of the common priest. Scenes consisting of Clemens dealing with troubled children and fixing his own dinner flesh out this aspect of the plot, but eventually these things are dropped in favor of the mystery. However, despite the script being a mixed bag, the acting makes it enjoyable. I usually don't care much for Slater, but he turns in a fairly effective performance here, subtly conveying Clemens' inadequacies while hearing confession and praying over dinner. Molly Parker is a nice compliment to Slater's performance, fleshing out the character histories without falling victim to clichéd theatrics. The rest of the cast also turns in respectable work, though none of them receive a tremendous amount of screen time. Director Lewin Webb would have been wise to drop the mystery angle and focus solely on Clemens' spiritual conflict, but given the movie's current state he handles things admirably. At times the visuals seem somewhat amateurish, but the film's overall aesthetic is brisk and gives a nice sense of ambience during the interior church scenes. The Confessor may not be entirely successful, but it beats doing penance. Image Transfer Review: The anamorphic 1.85:1 single-layer transfer looks nice. Contrast and colors are decent, but there's no sense of depth in the image. The overall picture is clean, but uninspiring. Audio Transfer Review: The Dolby Digital 5.1 audio mix engages the rear channels effectively with the score, but there's very little dynamic range. Apart from some occasional sound separation and directionality across the front soundstage, there's hardly any activity in the track. Dialogue is always audible and clean. Extras Review: The trailers for Saint Ralph, The Exorcism of Emily Rose, and USS Poseidon: Phantom Below are all shown in 1.85:1 anamorphic widescreen and Dolby Stereo surround sound. There are no other supplemental materials on this disc. 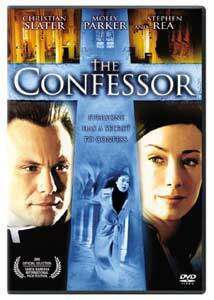 The Confessor is adequate entertainment, but it would be much better with a greater focus on character over plot. The image and sound transfers are sufficient, but the barebones DVD makes this more deserving of a rental than a purchase.